Hard candy is the favorite treat of kids of all ages. Foil wrapped candy in jars and bowls, colorful lollipops, homemade hard tack, peppermint sticks, sour balls and more all bring back the delightful memories of childhood. Sugar is to be enjoyed in moderation, we all know, but isn't a little indulgence such fun? You are sure to create smiles when you introduce a candy game at any party. Everyone will want to get involved so they will be sure to get their own sample of the goodies involved. Have you ever had the joy of taking part in a pinata poke? How about a candy scramble? No? You don't know what you're missing! Hard candy is also the perfect choice for parties of all sorts - birthdays, anniversaries, graduations, baby showers, and even corporate events. Although I'm partial to chocolate, you can run into a few problems when attempting a chocolate candy party favor in warm weather. Working with hard candies solves that problem nicely! Another great advantage to choosing hard lollies for parties and special events is that you can really get colorful quite easily and create themed parties in a jiffy. Think team sports colors, school colors for graduations, holiday colors, pinks and blues for baby showers, etc. You can buy bulk candy and save money if you are hosting a large event or if you need to create a candy buffet or make a large number of party favors. You can find wrapped candy in almost any color you need at A Candy Store. You'll also find a selection of novelty candies in different shapes and sizes. Just put on your thinking cap and start browsing. Sometimes I even like to come up with my theme AFTER I've looked over the candy options. The various sweet choices give me great party favor and party theme ideas. But what if you want to make your own candy? No problem at all. 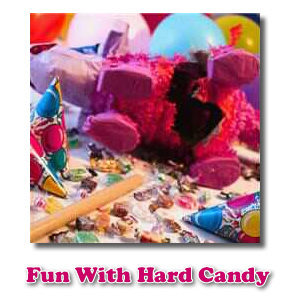 We've got a variety of hard candy recipes that you can choose from. Making hard lollies isn't really that difficult. It's mostly just a matter of boiling sugar and water (and usually some corn syrup) to the correct temperature and then adding your color and flavor at the end, working very quickly to either pour your hot syrup in candy molds or working the candy swiftly to make hard tack pieces before it sets.